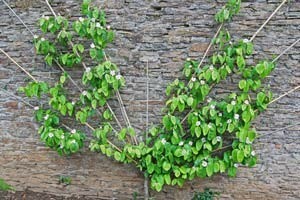 Espalier trees look attractive, whether grown against the house or on a suitable south-facing garden wall. This sunny position also helps fruit trees to produce a better crop than if allowed to grow without assistance. The cropping potential of a fruit tree can be remarkably enhanced by growing it as an espalier. Full sun on a sheltered, south-facing wall provides ideal conditions for fruit that does not readily thrive in our climate, such as apricots and peaches. It is quite easy to build a frame for the espalier yourself. An espalier is any plant that is trained to grow against a wall or along a framework, so that instead of developing a naturally rounded form, it grows into a flattened, two-dimensional shape. Creating an espalier takes time and a certain amount of skill. Select the sunniest south-facing wall in your garden or on your house for the espalier. You need to attach a framework to this wall, against which you can then train the espalier tree. The tree that you grow against it will only become as high and as wide as you allow, so the size of the framework is up to you. A large tree such as a pear can be allowed to grow across an entire wall. Other trees, such as a peach, grow better when kept relatively small. The best guide is to design an espalier framework that reflects the natural size of the mature tree. It is a good idea to establish a bed 1-1.3m wide at the base of the wall you have selected. Here you can plant all kinds of spring and summer flowers. Since soil dries out quickly next to a warm wall, you should improve its water-holding capacity with some bulky organic matter such as manure or compost. Dig a hole large enough for the root ball. It should be at least 20cm larger than the root ball on all sides, so that the first new roots can grow into loosened, improved soil. Turn the tree so that its strongest side branches point to the right and left. This will make tying them into the frame easier. The espalier tree needs an initial pruning before being attached to its frame. Select two strong side branches on the tree, one facing left, the other right, and remove all other side branches. You should also shorten the central shoot drastically, normally to about 50cm higher than the side branches. Prune this ‘leader’ so that the highest remaining bud points forward, away from the wall. Shorten the selected side branches by about a third. Here, too, the highest bud should point forward. Then tie the side branches to the slats so that they are as horizontal as possible. With apples and pears, you can remove the central shoot entirely and leave only two or four side branches instead. With apricots and peaches you can leave lots of side branches and train them to grow into a fan shape. This method is called a fan espalier. When you have placed the root ball in the hole, angle the trunk of the tree slightly towards the frame. The bottom of the trunk should be positioned at least 20cm away from the wall so that the tree has enough space to form roots comfortably in all directions. Firm the soil down well and water the tree thoroughly. Unlike free-standing specimens, espalier trees do not need staking, since the frame gives them all the support they need. However, before being tied to the frame the tree does need a first pruning in order to establish the correct shape. ‘Irish Peach’ and ‘Worcester Pearmain’ are good apple varieties to grow as espaliers; ‘Williams’, ‘Bon Chretien’ and ‘Conference’ pears are also suitable for growing in this way. Good cherry varieties include ‘Stella’ and ‘Sunburst’. Dwarf varieties of apples, cherry and pears are also highly suitable for growing as espaliers.